A team of medical experts from Sheba Medical Center at Tel Hashomer just returned from a successful medical humanitarian mission to Papua New Guinea where they performed over 80 vision-restoring eye surgeries. The mission was led by the Israel Center for Disaster Medicine and Humanitarian Response at Sheba Medical Center. 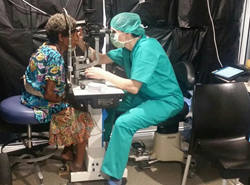 Sheba Medical Center, Tel Hashomer, Israel’s national hospital, just completed its second successful humanitarian medical mission to Papua New Guinea where their medical experts performed over 80 life-transforming eye surgeries that restored vision to the blind. More missions are scheduled to take place in April and May of this year. At the request of the Israeli Ministry of Foreign Affairs and in collaboration with Natan, an Israeli NGO, the Israel Center for Disaster Medicine and Humanitarian Response at Sheba Medical Center mobilized a team of Ophthalmology specialists headed by Dr. Eva Platner, Vitreo-Retina specialist, Goldschleger Eye Institute, to perform eye surgeries, primarily cataract surgeries. Sheba Medical Center’s Goldschleger Eye Institute is Israel’s largest academic ophthalmic center, known for excellence in eye care, research and teaching. “Humanitarianism is a core value for Sheba Medical Center, and this successful medical mission to Papua New Guinea is the latest example of how we export our expert resources to help as many people as possible all around the world,” said Prof. Yitshak Kreiss, Sheba Medical Center’s Director General and former Israel Defense Forces Surgeon General. Sheba’s medical experts performed the surgeries in an operating theater while sailing aboard an Australian Youth with a Mission (YWAM) ship that traveled the coast in effort to reach as many villages as possible. The team screened patients for cataract surgeries, most of whom were blind in both eyes caused by simple cataracts that had been neglected for years. The YWAM voyage, which took place from January 26th through February 11th included 120 people representing 20 nations. Two surgeons and three nurses from Sheba Medical Center were part of a ten-member Israeli team aboard the ship. The Israel Center for Disaster Medicine and Humanitarian Response at Sheba Medical Center boasts highly experienced specialists who continue to lead the charge in preparing and responding to global humanitarian crises and emergencies. Professor Yitshak Kreiss has made responding to humanitarian crises effectively with the highest standards of medical care and crisis leadership a core priority. Teams from Sheba have successfully participated in life-saving humanitarian missions in Zambia, Tanzania, Nigeria, Nepal, Haiti and elsewhere. Humanitarian aid has been a part of Sheba Medical Center’s mission since its establishment in 1948. Over the years, Sheba Medical Center has initiated successful projects in all fields of medicine, and has collaborated with national and international organizations in underserved regions. These projects include improvement in patient care, bringing complex patients for treatment back to Sheba, and training local personnel on-site.